While its origins may be a contentious issue (the Kiwis have long claimed they invented the sweet and gooey dessert but history books suggest it was actually the Americans), there’s no doubting Australians have made the pav their own. Or tried to at least, as anyone with a sunken meringue base could tell you. After cooking, too big a change in temperature makes the meringue collapse, so Christopher recommends completely cooling your pavlova in the oven before taking it out to dress. Add salt to egg whites and whisk in mixer or with electric mixer until soft peaks form. Begin at a low speed, and gradually build up to full speed. It will take 3 – 4 minutes to get soft peaks. Very gradually add sugar one tablespoon at a time, making sure each tablespoon is fully dissolved before adding more. Scrape seeds from the vanilla bean into the vinegar and fold through the meringue. Either pipe meringue into 6cm rounds on baking paper lined baking trays, or for one, full sized pavlova, place mixture into a 20cm round cake tin lined with baking paper. Use a spatula to smooth surface. Turn oven off and open door, leaving meringue inside to cool for 50 minutes. 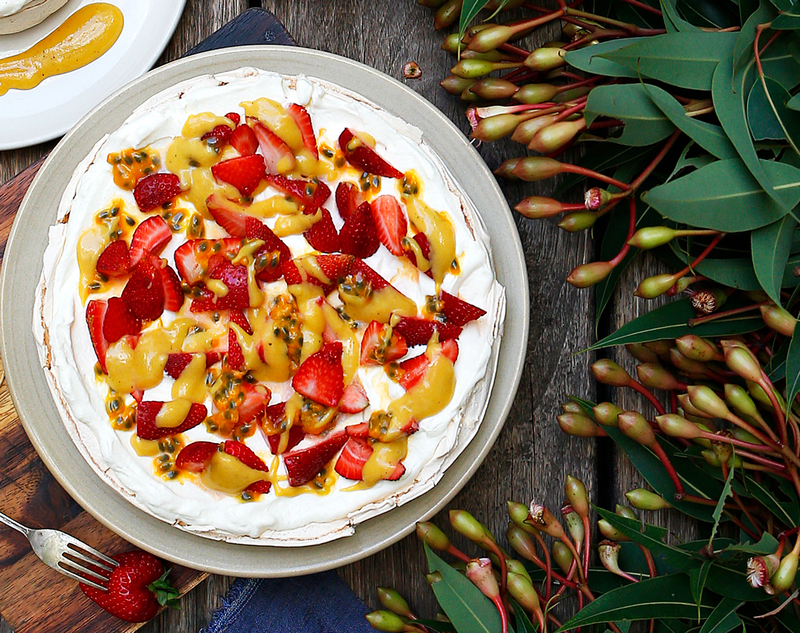 Top pavlova with softly whipped cream, fresh fruit and passionfruit curd. Stir sugar and butter in a small saucepan over medium heat until butter has melted and sugar has dissolved. Remove from heat and add passionfruit pulp and eggs. Whisk to combine. Return to low heat and stir continuously until mixture thickens. Do not allow to boil.